Every so often I come across a story - whether it be in the form of an anime, a novel, a video game - that captures my imagination seemingly without putting forth much effort to sell itself. 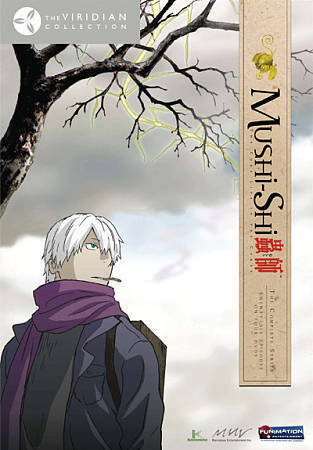 Mushi-Shi is one such series, combining more modern day fantasy with old folklore. Each episode is presented as a distinctly separate narrative, with new characters coming into play with each, yet all of the stories have a commonality - they all involve Ginko, a Mushi Master who is travelling the land to further his research on rare Mushi. Mushi are a mysterious lot. They are the most basic of life forms, visible only to certain people. Mushi influence the world around them - some in minute and barely noticeable ways, others having a direct and noticeable impact on individuals. While Mushi have no sense of good or evil, there are some that act as parasites, living off of host organisms at the cost of the vision or free will of the host. Similarly, the conclusions of the episodes will vary from bright and positive to dark and gloomy, with a handful ending on somewhat of a neutral note that may leave viewers divided as to whether the characters actually earned or lost in the grand scheme of things. Ginko is the only major character and one of only two recurring characters in the entire series. He constantly carries with him a small chest of drawers containing both information on the Mushi and some samples of them for research material. Ginko is incredibly knowledgeable about the Mushi and their influence on the world around him. Unlike most other Mushi Masters, however, Ginko has the strange ability to attract Mushi no matter where he goes, so he must be constantly on the move for the safety of others. His nomadic nature does alienate Ginko from society, though he seems to be able to relate much more easily to children and teens than with other adults. During his journey, Ginko meets a myriad of people who are either directly or indirectly affected by the Mush that live throughout the land. Some are fearful of the Mushi and their powers while others aren't entirely convinced that Mushi exist. Regardless of who is in need of help, Ginko always seems to aid people during his research. The secondary "guest" characters that come into play with each episode are, for the most part, fleshed out quite well. In some of the earlier episodes, less time is spent exploring the stories of those affected by the Mushi with more time devoted to exploring what the Mushi are and how Ginko's knowledge of them. As the series progresses, the opposite becomes true, as viewers are relatively familiar with the different types of Mushi. In some cases, an expanded backstory will help Ginko pinpoint some key trait of a character in order to aid them, but the biggest reason behind this shift in storytelling is seemingly to keep episodes from becoming predictable or monotonous. The time period in which the series takes place is never definitely defined, nor is the land through which Ginko travels (The latter, however, is largely implied to be Japan). Even the time spent between the first and last of the series' twenty-six episodes is not clearly defined. The architecture and clothing seen throughout might lead viewers to assume the series to take place in the Feudal era. However, the fact that each town Ginko visits has a relatively small population combined with the fact that none of them seem to be within close proximity to more largely-populated areas does not solidify this assumption, and for all the viewer knows, the series could take place in a modern day setting with Ginko travelling to a number of small isolated villages. This sense of ambiguity that the series carries from beginning to end fuels an atmosphere of mystery and fantasy. The series relies quite heavily on its art style as both a selling point and a means of conveying the various stories. It's very simplistic, yet conveys the mood through beautiful watercolor backgrounds and excellent lighting/shading effects. The soundtrack conveys more mellow moments through soothing - if not occasionally haunting - melodies, while more tense moments are accompanied by more primitive sounding drums. It's a minimalist approach to an extent, which is exactly what the series as a whole aims for - getting back to more traditional tales of fantasy and folklore. Mushi-Shi breaks the conventional methods of anime in favor of a more simplistic delivery. Each story combines just the right amount of fantasy and folklore while still grounding it in a very real and believable world. The delivery of the series is done so masterfully, utilizing an art style and soundtrack that stand out and beautiful and captivating without trying to be particularly edgy or in-your-face. Admittedly, the format of a few episodes late in the series feel as though they've been recycled from earlier on, but all in all there's something new to explore with each episode. A very unique anime, Mushi-Shi is one series that can deliver a phenomenal story without requiring the aid of constant edge-of-your-seat action, or even a recurring cast. Slant 6 and Capcom will be collaborating to bring Resident Evil: Operation Raccoon City to the Playstation 3, Xbox 360 and PC. The game will be squad-based and takes place in 1998, during the events of Resident Evil 2 and 3. Players will take control of one of Umbrella's Security Services, competing with US special forces and familiar faces from the Resident Evil universe as they face off against zombies and bio-organic weapons. A number of competitive online multiplayer modes have been promised, though no concrete details have been revealed yet. On a related note, anyone who purchases a copy of the upcoming 3DS release Resident Evil: The Mercenaries 3D will also get to play a demo for Resident Evil Revelations. Katamari Damacy was released for the Playstation 2 as a strange yet creative title that didn't exactly fit into any single category or genre. While it wasn't the most commercially successful game during its initial release, Katamari Damacy saw many favorable reviews and a buzz started about this game that would fuel a more successful release for the second title, We Love Katamari. 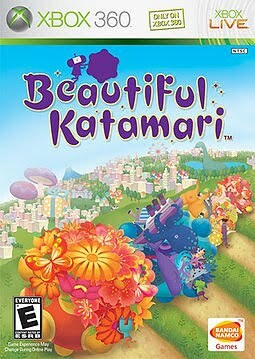 Skip ahead a few years, and Namco releases Beautiful Katamari for the Xbox 360, a title with plenty of familiar aspects and some new inclusions sprinkled throughout that make for an enjoyable - if not a tad predictable - next gen release. The levels that are included on the disc follow a similar format to those included on the original PS2 Katamari Damacy - each level is an expansion of the previous and will allow players to gradually explore more and more of the world around them. While the world of the original game proved to quite large, the world players are allowed to roll around in Beautiful Katamari is massive. Part of this extension is due to how much more developed each level feels. The chance of players getting stuck in tight areas is dramatically lower than with its predecessors, and overall the levels feel much more open and inviting to the whole concept of rolling wherever you want to. Another major improvement is the increased amount of smaller objects spread throughout the game, meaning players don't have to waste precious time desperately searching for that one item they need to increase their Katamari to the next size. While the constellation missions of the original Katamari Damacy had players searching for specific objects to roll up, the majority of the first game's missions simply asked for Katamaris of varying sizes and was not overly concerned with what materials went into each. In Beautiful Katamari, the King of All Cosmos specifies what objects fit the primary theme at the start of each mission. This could have been made a bit more challenging, but the majority of the items in a level will generally correlate to said theme. However, just because a player is able to roll up a Katamari to the specified size with the correct items doesn't mean that he/she will receive a high score - the King of All Cosmos also takes into account what percentage of the items therein fit the theme, adding an extra challenge to those more competitive. The homeworld of the Prince acts as the main menu, allowing players access to split-screen multiplayer, online multiplayer, the Xbox Live marketplace, a photo album, the memorial (host to the game's various cutscenes and soundtrack pieces), a complete item collection list, the various presents that can be found and subsequently used to decorate the Prince and his cousins, sound options, and the ability to save/load the game. It is here that players can also look back on the planets and stars they've made and the scores the King of All Cosmos has assigned to each, and even check out the high scores set by the Katamari community. The outlying planets and space stations are host to the actual levels, and can be increased in number if players choose to purchase new levels from the Xbox Live marketplace, adding more replay value to the game for a very reasonable sum of 60 points per level. Split-screen multiplayer hasn't changed much since the PS2 titles. Versus mode will have players competing to pick up the most of a specific item in a relatively small area. Cooperative mode, while more akin to the core gameplay of the single-player mode, takes some time to get used to and feels a bit clunky with two players trying to roll the same Katamari. Online is where the multiplayer experience is best, as players will compete against both the clock and each other to gather the most of a specific item. The winner is awarded cookies in lieu of actual points, and players can monitor their rankings within the community on the Katamari leaderboards. The soundtrack of Beautiful Katamari is host to many themes that will undoubtedly be familiar to veteran fans. With most of the pieces, if they aren't directly taken from the previous games, they are a variation. A few new tunes manage to sneak in and flow very well with the upbeat catchiness of the soundtrack. The art style is exactly the same, though it is now presented in HD - which isn't a particularly noticeable leap, considering the blocky nature of characters and items in the Katamari universe. Beautiful Katamari isn't as wildly inventive as the first in the series, but it certainly feels like Namco gave this title plenty of attention and delivered a more rounded-out gaming experience (no pun intended). If you're new to the franchise, Beautiful Katamari is a great representation of what Katamari is all about. If you've played through other Katamari titles, this is a nice addition to the series, but don't expect any inclusions to be major game-changers. Square Enix will be re-releasing Final Fantasy VI for the Wii Virtual Console before the end of March. The game was originally released for the SNES, and was later ported to the PSOne (along with Final Fantasy V) and the Gameboy Advance. No changes are planned for FFVI, though the title will cost slightly more than most SNES releases for the Virtual Console at 900 points.